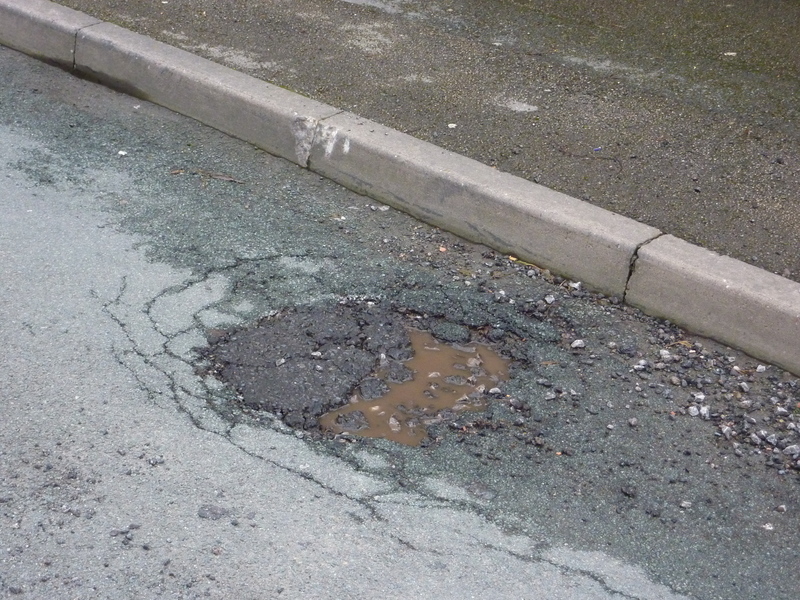 Readers will no doubt be aware of the recent controversy surrounding the appalling state of the roads in Walsall at the moment, a situation worsened by the recent bad weather. With this in mind, a local contributor sent this lengthy clip from The Walsall Observer, dated 5th February 1921. Although a little protracted, it shows that the local council (then Brownhills) contained exactly the same types of ineffectual blowhard, loudmouth, prima donna and windbag that can be witnessed at such meetings at the Civic Centre today. It’s worth reading to the end, just for the demonstration of just how pointless the whole affair was. Notice how many of those present gave their names to local streets. I’ve included some random, recent pictures of local potholes for illustrative purposes. None of them were caused by recent bad weather, all have existed for at least the last six months. They have all been reported to the council, some on several occasions. As of posting this, they are still unrepaired. You too can court utter futility and report potholes directly to Walsall Council, or use the excellent Fixmystreet site. Best of luck. The lyrics may change, but the song does indeed remain the same. I’ve had to transcribe the article, because the scan is understandably not in a condition that would read well onscreen. 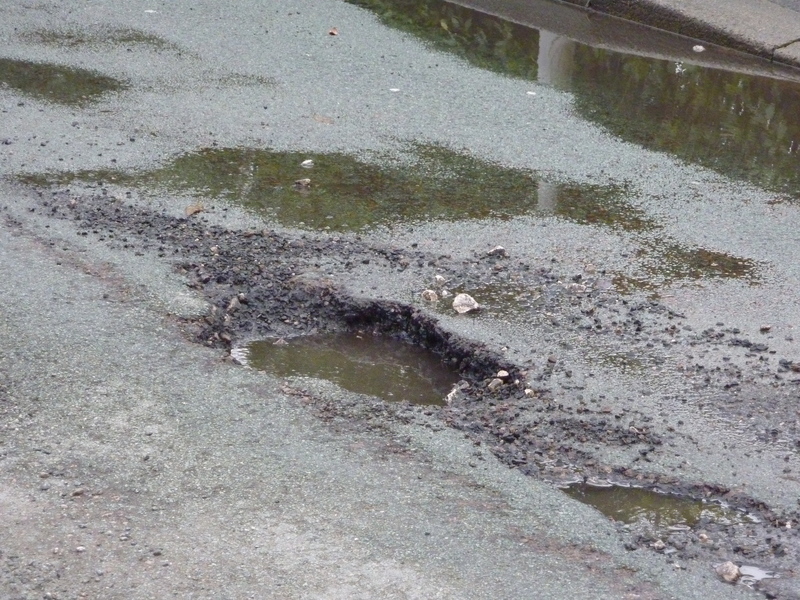 When a deputation of motorists attended the Brownhills Council meeting on Wednesday and complained about the bad state of the roads,there was some bickering among the Councillors as to whether the present body or the former Council are to blame. A letter was read from members of the Pelsall Miners Association complaining that sharp stones scattered on the roads punctured cycle tyres, and caused great inconvenience to miners riding to their work. Mr. Shepherd (a former member of the Council), who introduced the deputation, said they desired to protest against the gross neglect and scandalous condition of the roads in the district, with the exception of the main High Street at Brownhills. The highways, he said, were in such a bad state that they were positively dnagerous. The result was that he and others were continually having to spend money on new tyres and springs for their vehicles. Only last Sunday, a motor lorry, proceeding from the Rising Sun, narrowly avoided running into the Midland railway bridge owing to the rough roads having broken the front axle of the vehicle. Furthermore, the district was losing trade in consequence, because the motor papers were advising motorists to steer clear of the Brownhills neighbourhood owing to the awful condition of the highways. “A schoolboy could manage things better than they are being managed,” added the speaker, “and if there is no alteration the deputation are determined to communicate with Mr. Moncur at Stafford, or write complaining to the ministry of transport.” As soon as drivers got out of the Brownhills area, they noticed the difference. No matter which direction they drove they went from bad roads to good. At Cannock, most of the roads were as smooth as a billiard table. Mr. G. Cooper (chairman): You have our sympathy, but you have no right to say the stones are scattered with malicious intent. Mr. Shepherd: I do say so. The Chairman: Both myself and other members of the council have long ago exhausted all the adjectives we know in calling attention to the bad state of the roads , but there has been a combination of circumstances over which we have no control, which has caused them to be in a worse condition than they might have been. He pointed out that the council had tremendous difficulty in getting new rollers and materials, but were doing their level best. Mr Shepherd; I don’t see where the “best” comes in. A repair effected 4 weeks ago. The quality speaks volumes. Mr. Jarvis (another member of the deputation) said he had recently driven in many parts of the country, and he had come to the conclusion that the roads in the Brownhills district were the worst in the United Kingdom. 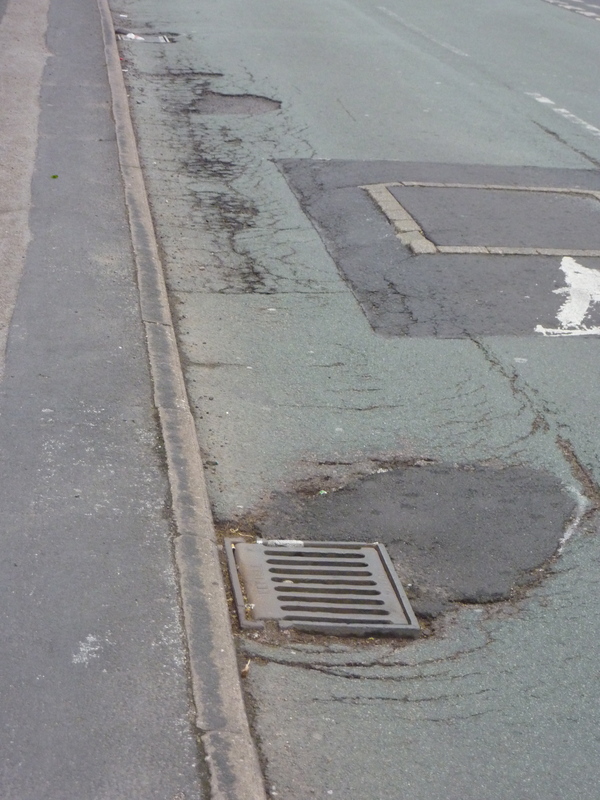 A garage proprietor from whom he hired a 5-ton lorry was continually complaining about the way in which Brownhills roads damaged the tyres, and had threatened to raise charges for hire if there was no improvement. Giving his experiences driving a brand new car last week, Mr. Jarvis said that no sooner was he out of the Cannock area into that of Brownhills than the road-shocks upset the whole of the electric lighting of the car, causing £2 damage. Considering he was paying £23 in taxation on that car, it was not good enough that he should be obliged to tolerate such bad roads. Mr. Cooper: We agree with all you have said about the roads. Mr. Jarvis: Well, can’t something be done? The Chairman: Quite honestly, we are doing the very best we can. Mr. Jarvis: How long will it be before there is any improvement? The Chairman: As soon as possible. The Surveyor (Mr. Grimwood) explained the difficulties with which he had to contend. For some time, he said, the work had been held up for want of a roller, but now he had the promise of a new roller he was hoping soon to effect an improvement. He agreed that it was a bad thing to have loose stones on the road surface, but he was obliged to do all he could to fill up the potholes. Mr. Jarvis complained that no binding was put among the stones, with the result that the first car that came along scattered them. He had seen men throwing stones down without any regard as to whether they went into the holes or not. The surveyor said he was sorry that the deputation had had occasion to attend. “I can assure you,” he added, “that matters are a great deal worse for me than they are for you, because I have been handicapped; but I believe that we are now practically over the difficulty.” He wanted it to be clearly understood that the present repair of the Watling Street was only temporary. The idea was to provide a basis for the tar macadam, which was very difficult to get. He did not want them to expect that within a month everything would be in order. Mr. Jarvis said there were lying for sale at Richborough 150 steam rollers which had been brought over from France. The Surveyor replied that these were too heavy for tar macadam work. What every motorist wanted was a tarmac road. The Council’s road programme for the next 12 months involved £38,000, but at present they had not got the money. Mr. Hodgkins said the deputation had not told them anything more about the bad condition of the roads than they already knew. Mr. Jarvis (a member of the Council) said the blame must not be laid at the door of the present council. The war had caused the work to be held up. If the deputation knew the amount of money the Council had spent on materials and the difficulties they had to content with they would appreciate that the Council had done their best. Mr. Cresswell recalled that the leader of the deputation, Mr. Shepherd, was a member of the Council in 1916, so that he was partly responsible for the condition that the roads were in today. When, in 1916, the Council were told that the cost of repairing the steam roller would be £300 they could not see their way to spend the money, with the result that the Surveyor was without an efficient roller (a matter which had previously been discussed) when the chairman ruled him out of order. There was some disorder when Mr. Taylor rose to defend the old Council. He said he had been a member for twenty years, and the roads were in a far better condition when the present council took them over than they were today. There had been more waste in the Surveyor’s department during the last two years than for the seventeen years previously. When Mr. Emery rose to speak, several members appealed to the Chairman to rule the discussion out of order. “As a member of the old Council,” said Mr. Emery, “I wont be villified. I won’t be put down. You are throwing the blame on to the old Council. Yet years ago, when we only had a 3d. rate, the roads were fifty times better than they are now. What has happened since the last election? We have spent £10,000. Mr. Blakemore, interrupting, said that if the Chairman did not put a stop to the discussion some of the members would leave the room. The Chairman: I shall adjourn the Council. Mr. Jarvis (on behalf of the deputation): We we thank you very much, and we hope there will be an improvement. After the deputation had left the room, Mr. Perks said it was quite true that the roads were covered with thousands of pieces of sharp stones. Personally, he found it impossible to ride a motorbike and cyclists were continually getting punctures. Mr. Cresswell said it was evident that the work had not been done in a practical manner. They all seemed agreed that the roads were in a bad state, yet no one suggested a remedy. More money had been spent in the last two years on the roads than for ten years before. Yet the roads were worse than ever. He knew there was a different kind of traffic today. Mr. Adams: Yes, and different prices for the materials. Mr. Cooper: Five times as much. Mr. Hodgkins thought there had been no system in carrying out the work; while Mr. Taylor said he had seen stones as big as his fist on the roads. Mr. Hogkins: We ought to have had the road foreman here tonight. The Chairman: We have had enough of it now; we will get on to the next business. This entry was posted in Brownhills stuff, cycling, Environment, It makes me mad!, Just plain daft, Local History, Local media, Local politics, Shared media, Shared memories, Walsall Council and tagged Brownhills, Brownhills Council, Brownhills local history, Brownhills roads, Cheap tat, fixmystreet, Local History, Local politics, New Photos, potholes, road repairs, Silly, Walsall, Walsall Council, Walsall Observer 1921, Walsall politics, Walsall Potholes. Bookmark the permalink. Is this time for me to ressurect this old chestnut? Please excuse the woeful web skillz and photograhy. When it comes to the road themselves, I’m becoming very tireed of having to spend a innapropriate amount of time looking for potholes to avoid bending an alloy wheel, and having to watch fro gravel from the broken road surface when I should be watching the traffic. I currently live in Rome (though I’m a Pelsallian and am back for a visit next week, in fact) where – oh the irony – they appear to be utterly ignorant when it comes to road laying and maintenance. It’s hard to believe that I’m in one of Europe’s great capitals when I – like you Stymaster – have to spend a highly disproportionate amount of time looking directly at the road surface, which, believe it or not, is even worse than that in Walsall. What makes this situation even more lamentable is that, as far as I understand it, there are more two-wheelers in Rome than any other city in Europe (powered, not bicycles, although the latter are growing in number despite the hostile environment). The mayor has recently ‘declared war’ on contractors who carry out sub-standard resurfacing and repair work, but I fear that cobblers and twoddle are international languages.